The Landmark International Hotel, a joint venture 4-star hotel is a subsidiary of Guangdong CTS Landmark Hotel Holding Ltd. It is located in the heart of Guangzhou new district-Tianhe Central Business District of finance, trading, shopping, technology and culture. It is a multi-functional intellectual and commercial hotel of accommodation, conference, business,food and beverage, offices, entertainment as well as leisure. 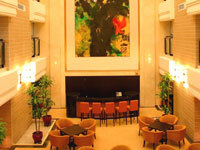 Enjoying the prime location, the hotel is next to the Eastern Railway Station and Metro Station. It takes only 10 minutes by subway from CECF Pazhou Complex and 30minutes drive away from Baiyun International Airport. The elegant and fashionable appearance of the hotel makes it a great landmark in the busiest business area in North Tianhe. 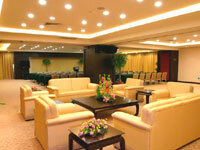 The hotel has 198 spacious and well-appointed guest rooms of various types with spectacular view of the modern city. The hotel's deluxe guestrooms feature excellent city views, and all rooms feature satellite TV and internet access.